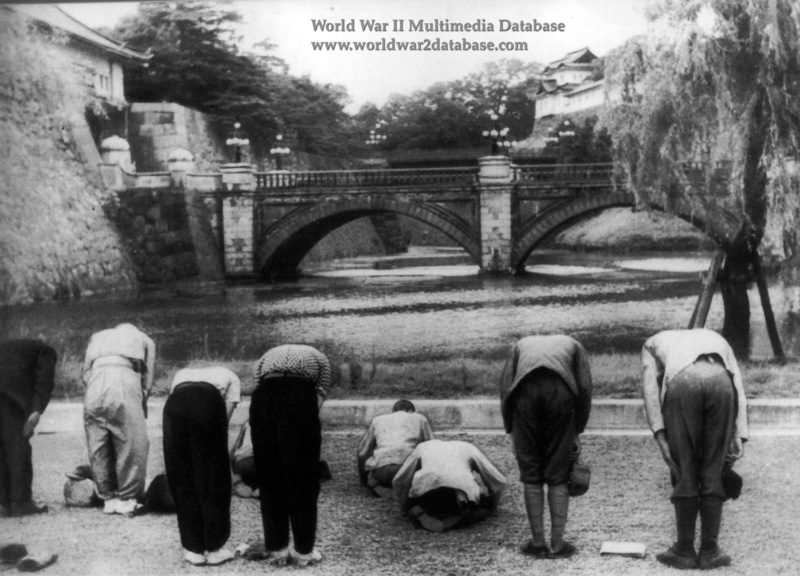 Japanese pay their respects to the Emperor at the North Gate of the Imperial Palace. The Gyokuon-hōsō ("Jewel Voice Broadcast"), was the radio broadcast in which the Japanese emperor Hirohito read out the Imperial Rescript on the Termination of the War (Daitoa-senso-shūketsu-no-shosho), announcing to the Japanese people that the Japanese Government had accepted the Potsdam Declaration demanding the unconditional surrender of the Japanese military. This speech was broadcast at noon Japan standard time on August 15, 1945. Responses to the emperor's broadcast varied greatly. Some residents of Tokyo did make their way to the imperial palace, still standing amid a ruined cityscape. American policy makers had excluded this as a bombing target, although part of it had been inadvertently destroyed anyway. Photographs of them kneeling on the gravel in front of the palace, bowing in sorrow for having failed to live up to the emperor's hopes and expectations, later were offered as a defining image for the moment of capitulation. This was a misleading image. The number of people who gathered before the imperial residence was relatively small, and the tears that ordinary people everywhere did shed reflected a multitude of sentiments apart from emperor-centered grief: anguish, regret, bereavement, anger at having been deceived, sudden emptiness and loss of purpose — or simple joy at the unexpected surcease of misery and death. Kido Koichi, the lord keeper of the privy seal and Emperor Hirohito's closest confidant, captured the palpable sense of relief in a diary entry in which he noted that some people were actually cheering in front of the palace. It was clear, he observed with some ambivalence, that they felt a great burden had been lifted.